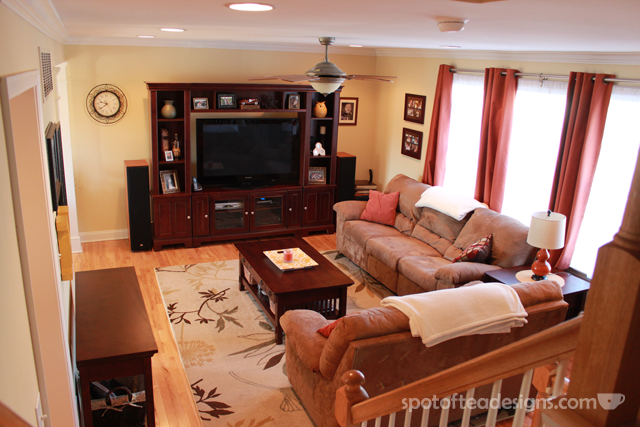 Some of the things I loved about our house upon our first view was the open floor plan, the beautiful wood floors and coordinating wood banisters on the main kitchen/living floor. 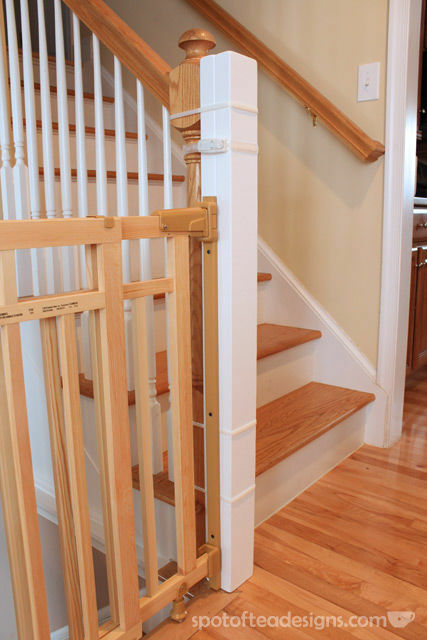 But when it came time to think about baby proofing, we started running into some problems with these wood banisters. For one, the posts at the top of the main floor were not parallel to one another in order to squarely install a gate. Second, I was not thrilled at the thought of ruining these banisters with screws and holes that we’d have to patch up later. Luckily, I came across this post from Beauty in the Ordinary which gave us some ideas to fix our issues. 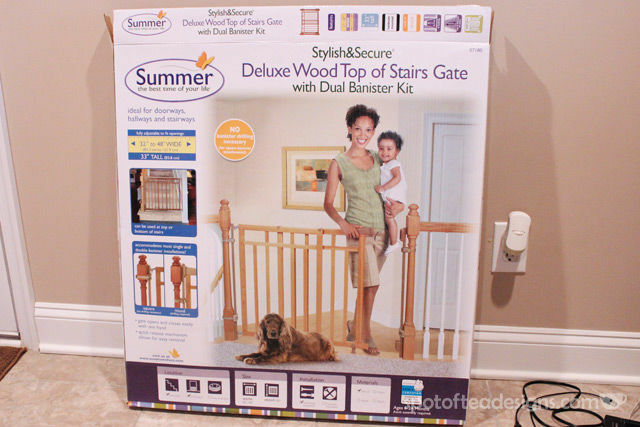 We visited the baby stores and chose the above Summer Infant Dual Banister Gate, found at Babies R Us. It was important to us that the gate did not have a bar that ran along the bottom as it is known to become a tripping hazard and since this was going to be at the top of a set of stairs, the less hazards the better! Next, Derek bought some wood and got to work creating pieces that would create a more parallel space between the two banisters. 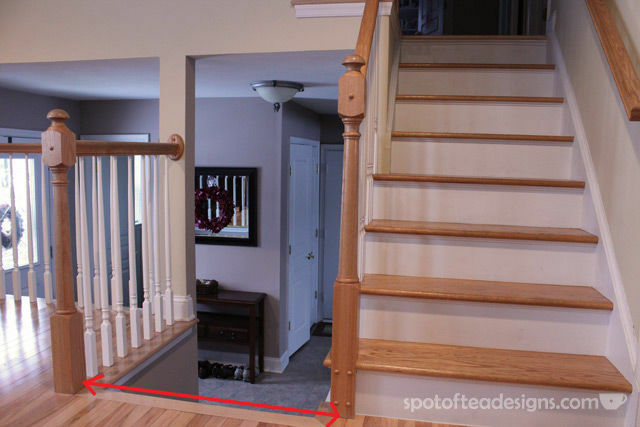 For the right banister, he screwed together two pieces of wood together to create the depth we needed. 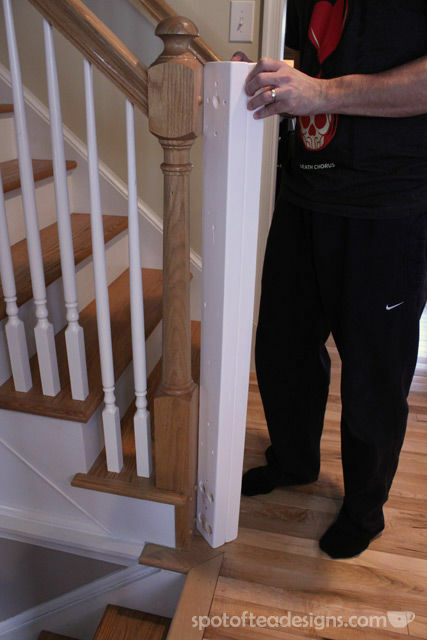 He sanded, painting and created some holes to allow for the wood piece to be flush against the banister by covering the decorative screw covers. 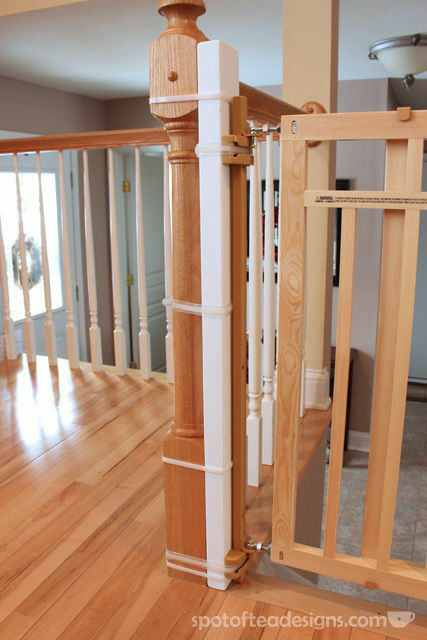 You can see here how he zip tied the wood piece to the banister and was then able to screw the baby gate directly to this extended wood structure, saving our wood banisters from being ruined and ultimately creating the proper parallel structure we needed for our stairs. Here’s a close up shot of the left banister. This one only needed one piece of wood zip tied to create the structure needed. 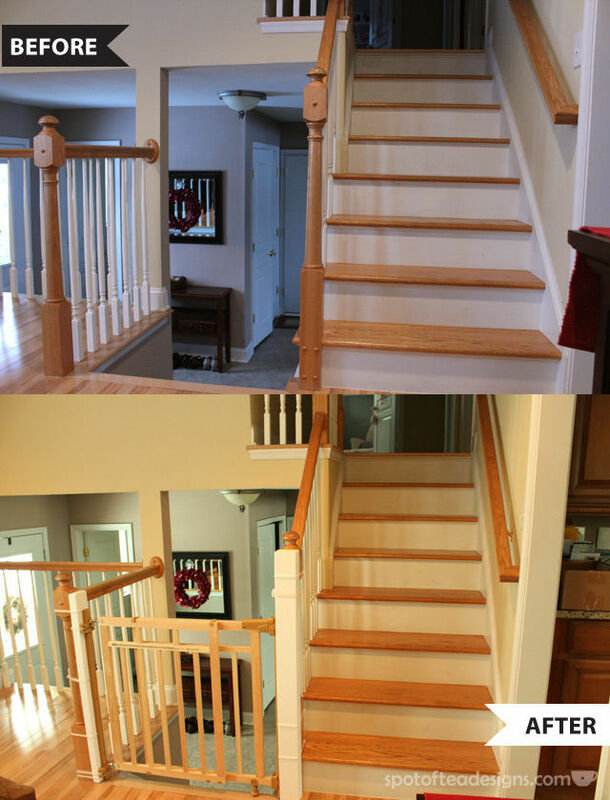 Again, our wood banisters were saved from screw holes! And here is my favorite part, the before and after shots! Now since Brielle isn’t all that mobile yet (but she is rolling, yay!) we took advantage of the easy removable feature of this gate and lifted the door part off the hinges to be stored until a later date, or when a newly walking set of cousins come to visit. The wood structure pieces are of course still attached, but the gate door is not installed until needed. Another great feature of this kit! For more information on ways we babyproofed our home, read this follow up post which includes more product recommendations on the items we use and love!